This Chili Cornbread Bake is just the right amount of slightly sweet and spicy, and it’s sure to hit the spot for your comfort food cravings. Chili and cornbread are such a great combination, and with this dish you can bake them both together and serve them up as one! 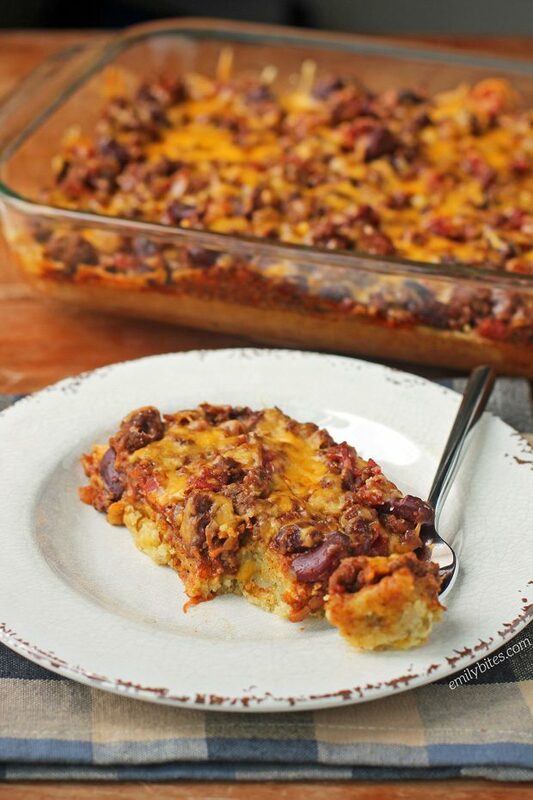 The bottom layer is a lightly sweet, super moist seasoned cornbread and it’s topped with layer of hearty chili and finished off with some melted cheese. YUM, right? If you’ve ever made the Chicken Tamale Bake on my blog from a few years back, I used the same cornbread layer for this recipe. As an added bonus, this Chili Cornbread Bake is super easy to make and doesn’t take long at all – perfect for a weeknight meal! 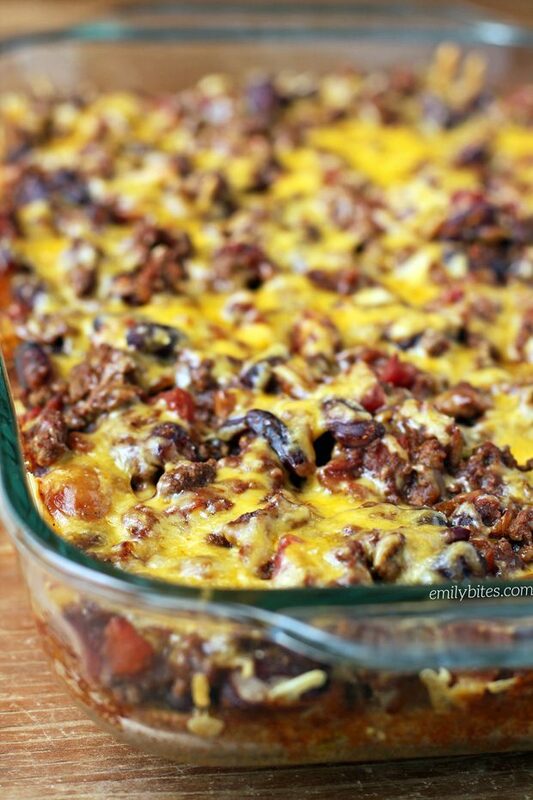 Looking for more lightened up comfort food casseroles like this Chili Cornbread Bake? Check out my Bubble Up Chicken Pot Pie Casserole, Teriyaki Chicken and Rice Casserole, Eggplant Parmesan Casserole, Beef Enchilada Quinoa Bake, Chicken Cordon Bleu Pasta Bake, Bubble Up Pizza Casserole, Cheesy Chicken, Broccoli and Rice Casserole, Deep Dish Sloppy Joe Casserole and many more in the Casseroles category of my Recipe Index! Pre-heat the oven to 400. Lightly mist a 9×13 baking dish with cooking spray and set aside. In a large mixing bowl, combine the egg, milk, 1 teaspoon of the cumin, 1/8 teaspoon of the cayenne, creamed corn, diced chilies and corn muffin mix. Stir together until fully mixed and pour into the prepared baking dish. Spread into an even layer and bake for 18-20 minutes until a toothpick comes out smooth. Keep oven at 400. While the cornbread layer is cooking, bring a large saute pan or medium pot to medium heat and add the ground beef. Use a wooden spoon to break it up into small pieces as it cooks. When the meat is breaking up and almost browned, add the onions and the garlic and stir together. Continue to cook another few minutes until the meat is browned and onions are softened. Add the kidney beans, diced tomatoes, chili powder, salt, and remaining 1 teaspoon of cumin and ¼ teaspoon of cayenne to the meat mixture and stir together until well combined. Reduce the heat to low and simmer, uncovered, for about 5 minutes. Use a fork to poke holes all over the prepared cornbread layer. When the chili is done, spoon it over the top of the cornbread layer to form another even layer. Sprinkle the shredded cheddar cheese over the chili and return it to the oven for another 15 minutes. I made this last night. It was a huge hit!!! Thank you Emily for your yummy recipes!!!! Subbed ground turkey. It was delicious! I’m so glad you loved it, Amy! I love black beans. I think it would be great! Emily I love anything with cornbread, as does my family, chili rates HIGH on that list! And I love black beans! OK so pretty much every meal I cook now is one of yours. This looks amazing, I can’t wait to try it! How many servings does this make and what is each serving size? Thanks! Looks like a great recipe and I will try it! Sorry, I saw that it makes 8 servings, after I posted my comment! Ha! This might be my new favorite! Perfect amount of spice. And I’m a sucker for cornbread so this was just the ultimate dinner for me. Thanks, Emily! OMG it was so good! I added a can of rotel to the chili mixture and used ground turkey instead of beef, but otherwise kept it the same. YUM YUM YUM. I would eat anything on top of that cornbread! This looks amazing! Can’t wait to try — definitely adding it to my meal plan for next week. Do you happen to know if it freezes well? Either pre- or post-baking? Thanks in advance, and thank you for all your wonderful + delicious recipes! Hi Tessla, I don’t freeze anything so I am the worst at answering this question! If you try it out let me know! This is a great recipe Emily! I doubled the recipe since friends were coming over and everyone loved it! Since I was doubling it I used half ground turkey and half hamburger and it was so delicious. This recipe is a keeper! Emily, I’m in love with this dish!! I meal prepped it for my husband and I and we bother love it! Thank you thank you! Literally eating this right now for lunch (and for the next 3 days). Came on to double check the points value, and decided to leave a message saying how delicious it is! Plus easy to make, doesn’t required a ton of expensive ingredients, and great to prep ahead for lunches for the week. Basically, this will be a new staple. I really dislike corn, have never used cream corn. Do you think it would be okay if I ran it through a stick blender to make it super smooth before I add to the recipe? I made this tonight. I upped the meat amount with a mix of lean ground beef and ground chicken breast and since I’m a boymom with a military husband, I added extra spice too. This was perfect. Very filling and liked by all. Even with my tweaks, it was only 10 points a serving. Husband asked for the leftovers to be added to his lunchbox tomorrow. As my hubby said, this recipe could be changed around just by changing the chili. Thank you for a great recipe. I’ll be making it again. I have made this before and LOVE this recipe! My company is having a chili cookoff & I want to make this (bc I know I’ll win 😉 ) but it has to be made in a crock pot for the competition. I’m going to try to play around with it tomorrow, but do you have any ideas/suggestions for crock pot cooking this?? We loooooved this! Thank you so much! Looks great, but I don’t eat meat. What do you think of adding more beans and regular peppers? I’m pretty much addicted to this chili cornbread bake. Hubby and I LOVE it!! Made 2 of these tonight one made with hamburger and another made with Trader Joe’s Beefless ground beef, for my vegetarian daughter. Actually the vegetarian looked better. But thanks for a great recipe! Oh my daughters name is Emily, too. I loved this, but it was wayyyyyyy too spicy! Wow! We just had this for dinner! So flavorful! I made an account just to comment on this recipe. I made it tonight and it is amaaaazing. The only swap I did was ground chicken since I had it on hand, and I upped the spice because I like my chili to buuuurn. The cornbread base is to die for. It’s recipes like this that really make me feel like I can succeed on my weight loss journey 🙂 thanks so much! I made this tonite and my husband and I loved it. Thank you Emily for you wonderful recipes. I have tried many of your recipes. My husband and I both love them. They are helping me with my Weight watchers journey. Thank you so much. I am sure my weight watchers group is tired of hearing about your web site. I’m making your ham and cheese quiche for a bridal shower brunch in a couple of weeks. Keep up the great work. Thank you again. This is insanely spicy. 2 tablespoons of chili powder is way too much. I think you meant to type 2 teaspoons. Other than that, it’s delicious. Nope, I meant 2 tablespoons! We actually just made this again tonight for dinner :). Feel free to adjust to your tastes. My family loves it this way! Hey! I’m not a fan of creamed corn. Would I be able to swap with regular corn? I haven’t tried it that way but I really encourage you to try it with the creamed corn because you will never know it’s there, I promise. I also do not eat creamed corn, this will not taste like it! Tried it tonight and went with the creamed corn… You were right! I didn’t even notice it. Turned out delicious and the boyfriend gobbled it down! I loved this! What a great recipe! You know it is good when you go to work the next day and you can’t wait to get home to eat some leftovers. LOL. My boyfriend loved it just as much. Thanks for sharing. Hi. I can’t find corn muffin/bread mix! Augh! Do you have some suggestions how to make this using regular cornmeal. Thank you! I came to the comments looking for alternatives to the cornbread mix as I can’t find it, either!